In late March, I visited Kawaguchi to take a photo to be used on the cover of a book. Masahiko Sato, the author of this book, became demented at the age of 51. A message of hope that a happy life may be still possible by wisdom and creativity is contained in this book titled “From me with dementia to you”. The purpose of my visit was to take his portrait. I met Nishi-san, an editor of Otsuki Shoten (the publisher), at Kawaguchi train station. After visiting Sato-san’s home, I continued to take photos moving to a nearby botanical garden. As I understand, this was the course that Sato-san often takes for a walk. It was a bright sunny day, and strong afternoon sunshine was hitting young leaves and various colorful flowers. After an hour or so, three of us took the bus from the bus stop in front of the botanical garden for Kawagushi station. Angled sunshine was intruding inside the bus as well. When the bus made a turn at the intersection, the angle of the sunshine coming through the window of the bus changed and the shade of the seats made an interesting geometric pattern on the floor of the bus. And when the sunshine hit the camera directly, strong backlit flare was made on the view finder. The bus was almost empty, and there were only 2 or 3 people other than the three of us. It was a quiet idle time between noon and late afternoon, when the bus will be busy with many people. At one bus stop, two small girls and their mother came on board and sat in the front seat of the bus. The girls were at the age of kindergarten or even smaller. After a few stops, the elder girl pushed the buzzer button to inform the driver that they would get off the bus at the next stop as if it was her routine action. “OK. We will stop at the next stop.” said the driver. Then the younger girl, seeing her elder sister pushing the buzzer button, started to complain “I wanted to push the buzzer button.” The conversation between the girls and the mother was heartwarming, and the voices of the mother trying to calm down the younger girl and that of the complaining younger girl vaguely reached me who was sitting in the back of the bus. Then the bus driver spoke through the microphone “You can push the buzzer button once again. As many times as you want. We will stop at the next stop for sure.” Hearing such an unexpected words from the bus driver, the younger girl happily pushed the buzzer button. “OK. We will stop at the next stop.” said the driver. Probably the bus driver offered this special chance as it was not during the busy rush hour in the morning or late afternoon when all the passengers would be irritated. Such a conversation made a warm atmosphere in the bus. The mother and the girl thanked the bus driver and got off. “Thank you. Use this bus again, will you?” A gentle phrase by the bus driver chased the mother and the girls. It must have become a highlight of a good day for that younger girl. The bus driver had a peaceful and rich appearance much more than I expected. When I saw his face, I was convinced about the incident a while ago. I said “It was an impressive scene. Excuse me, but may I take your photo?” to the driver and aimed my camera toward him. This driver was humble from the beginning to the end. His conduct gave me an impression of a small flower blooming without being noticed and forgotten in the busy daily activities. Under the common sense of our society, bus drivers will be spending all his energy trying to operate the bus safely and they have no obligation nor relaxed mentality to cope with a selfish request of a small girl. But he was different. He had full of love toward the passengers. He was a man of love. I do not think that I am the only one in the world who hopes that the world will be a better place if there were more of this type of people. 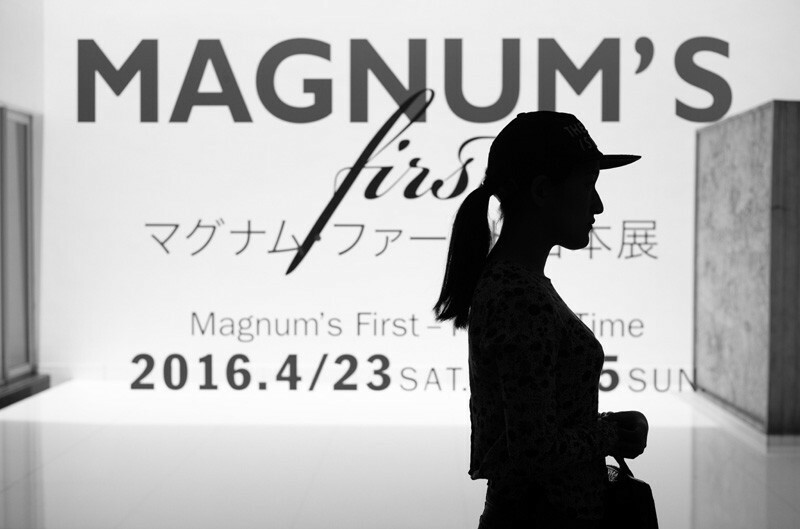 Sometime after this incident, in May, a photo exhibition titled “Magnum First” was held at Hillside Forum in Daikan-yama at a walking distance. There are some chic stores and galleries in Daikan-yama, and it is a good place for shopping and sightseeing. There are many tall trees in this corner for the forum which block the strong sunshine in summer time, and it is very comfortable in the shade. The fact that an event is held quietly without a signboard to be easily noticed or someone calling out to people passing by seems to be a typical Daikan-yama style. It recalls me of a modest signboard on a building in Europe or a small gold nameplate buried in the wall of a stone made building in spite of the fact that it belonged to one of the major companies. This photo exhibition was a very unique one displaying the original prints from the first photo exhibition as Magnum held in 1955 in Austria by eight Magnum photographers. It was common in those days that photos were printed as published material and delivered to people. In other words, the final form of photos was printed material, such as magazine, and photo exhibition was not a popular concept. In spite of such era, the participating photographers selected photos and constructed them for the exhibition. The method of display in those days was not to put in a frame but to attach the printing paper directly on a temporarily made wooden wall. While it was unknown for a while where those photos from the exhibition were kept, in 2006 50 years after the exhibition, the photos, stored in a wooden box, were found in a basement storage room of the French cultural center in Innsbruck. That photo exhibition was revived as “Magnum First”, and came to Daikan-yama after touring through 11 cities of the world. The gallery talk by Hideaki Watanabe-san, a photographer who made a lot of effort for the exhibition in Japan this time, and Junko Ogawa-san, who belongs to Magnum Tokyo Branch Office, included some interesting episodes. One of them was regarding a group of photos taken before and after assassination of Gandhi of India taken by Bresson in 1948. Gandhi’s natural face appears in some photos, followed by a photo of Prime Minister Nehru who made his first announcement about the assassination of Gandhi, and the people of India who became distressed because of deep sorrow. About the same time, Margaret Bourke-White, a female press photographer dispatched by Life magazine, also took photos of Gandhi, but there is no photo of the people after the assassination left. The reason is said to be that because her phot shooting attitude was so blunt that the people got upset, stopped her from taking photos, and her film was taken out of her camera. On the other hand, Bresson took Gandhi’s photo of Gandhi’s daily life, and after the assassination, Bresson probably was careful enough not to disturb the atmosphere in his photo taking. As a result, he was not involved in any trouble, and his photographs still remain. Other photos included photos of children by Robert Capa, masterpieces by Werner Bischof, and still photos from the movie titled “Pyramid” by Ernst Haas. Around 1950 when these photos were taken, a few years after the World War II has ended, it was the time when people started to feel the sign of peace and hope. All the photos exhibited were focused on “humanism by photography”, which was the ideal of Magnum, and looked at people in their daily life with eyes of love. I thought here was some basic thing that we, in the world today, should not forget. Thinking of my own past, I realized that the photos were reminding me of the view point that I must maintain as a portrayer, and they left a lasting impression on me. During the exhibition period, I visited the exhibition several times. I saw many young people at the exhibition looking intently at the photos, which made me put a great confidence in them. Through the bus driver of Kawaguchu and “Magnum First” exhibition, I made a pledge that I should never forget the word “Something with Love, Something without Love”.